What sunk a sub powered by cranking by hand? The hand-cranked H.L. Hunley rests in a 76,000-gallon conservation tank. It will be treated with a solution of sodium hydroxide for about three months to loosen the encrustation on the hull and interior. Then the sub will soak in the chemical bath for at least four more years to prevent further corrosion. Eventually the Hunley will be put on display in a new museum in North Charleston. Conservationists will drain the tank each day. Wearing protective gear, they will use hand tools to remove the hard sand, sediment and rust coating. Then they will refill the tank each evening. "This is the end of the beginning" of the preservation work, said Nestor Gonzalez-Pereyra, the associate director of the Lasch Conservation Center at Clemson University's Restoration Institute. "In a year we may be able to have the clues." Removing the encrustation could yield clues to its sinking off Charleston, S.C., in February 1864. The war had begun with the bombardment of Fort Sumter in Charleston Harbor three years earlier. The 40-foot sub and its crew of eight had set off a powder charge that sank the Union blockade ship USS Housatonic. The Confederacy wanted to break a Union blockade of Charleston. But the Hunley never returned and just why remains a mystery. The wreck was discovered off the coast in 1995. The silt-filled interior was excavated and the remains of the crewmen removed. Last year, scientists announced it appears the charge that sank the Houstonic was attached to the 16-foot spar at the front of the sub. That could mean the crew was knocked unconscious and died before awakening. A closer look at the hull may provide clues. Critical thinking challenge: Why was the Hunley powered by people instead of an engine? 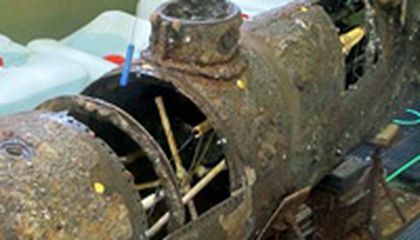 Did engines that could operate underwater exist in the 1860s? Them finding the submarine is so cool, especially with it being so old! It would be scary to back then and in a submarine that you to hand crank. I think this is a good idea. I would love to come see this one day. I enjoy learning about history, especially when i get to see it in real life. i hope everything goes perfect and everything works out. I would love to see this and i hope it works. I think thats good that they are trying to solve a mystery such as this one. I think it is going to be difficult to solve but if the people who are working on it are up to the challenge all the power to them. I wonder how long it will take before they find out how the submarine sank. Like what knocked out the men inside of it. This is the first time I have ever heard of a hand cranked submarine. I think that these types of ships are cool and interesting. Just think of how much muscle each person on that ship needed to crank to power the whole ship. That's what I call a whole lot of muscle. 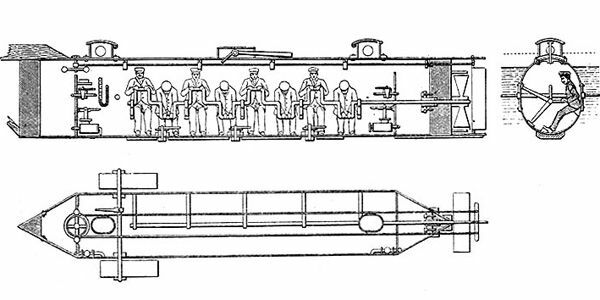 A probable reason the Hunley was powered by people instead of an engine because engines probably were not common then, or not yet created. It is cool to read about old artifacts because they hold so much history. It can take you back in time, and it helps to explain some events that still remain a mystery to us. This is really interesting. This submarine was powered by hand cranks because in 1864 engines that ran underwater did not exist. In 1864 there was only one type of engine, The Steam Engine. The ship was most likely hand powered because they were probably quit so the enemy wouldn't be able to hear them if they were going to make an attack or something, it was most likely hand powered because they couldn't put a motor in the ship or have it fit and still be able to put people in the sub.